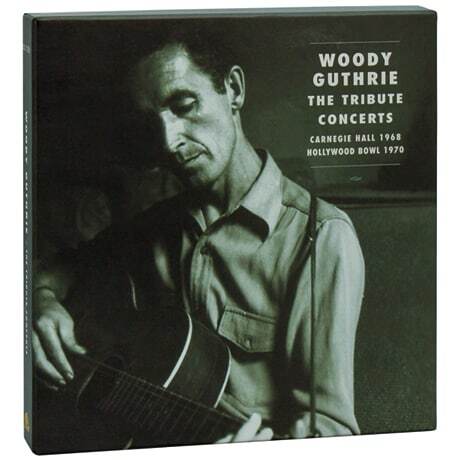 The 1967 death of Woody Guthrie was a heavy blow to American music, and many of his friends and admirers felt compelled to remember him with a memorial concert at Carnegie Hall the following year, and again in 1970 at the Hollywood Bowl; the quality of the performers reflects well on the folk singer. Here are Pete Seeger and Arlo Guthrie ("This Train Is Bound for Glory"), Bob Dylan & the Band ("Dear Mrs. Roosevelt"), Joan Baez ("Hobo's Lullaby"), Tom Paxton ("Pretty Boy Floyd"), Odetta ("Why Oh Why"), and Richie Havens ("Vigilante Man"). Among the other contributors are Judy Collins, Rambling Jack Elliott, Peter Fonda, and Country Joe McDonald; many of the performers are also featured here in interviews, fondly recalling Guthrie's impact upon their lives and music. This deluxe, slipcased set includes two lavish, oversized hardcover books, one with essays, reminiscences, dozens of rare photos, and a reproduction of the concert booklet, while the other contains lyrics and guitar chords for 29 of Guthrie's songs, as well as images from the Dust Bowl.